On Friday, we looked quickly at some estimates in the International Monetary Fund's World Economic Outlook for oil elasticities, as well as their projections for economic growth. 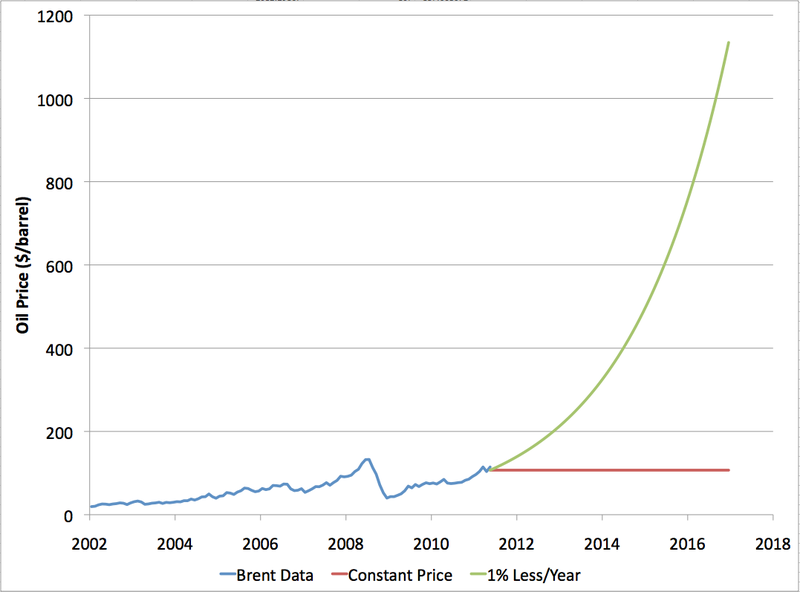 In this post, let's go through some of the implications of these numbers for oil supply and/or oil prices. This is annual percentage growth in total gross world product, corrected for inflation, and expressed at Purchasing Power Parity (PPP: ie, in which goods and services from non US countries are corrected to US prices assuming equivalent goods and services should be priced the same, rather than using market exchange rates). 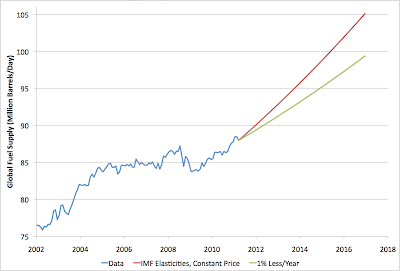 You can see that the IMF is basically forecasting five years of pretty good growth - near the top of the historical range, but certainly not above it. They are not projecting any serious global slowdowns, still less an outright global recession (those are rare - 2009 was the only case in the last thirty years). The blue curve there is actual data for global liquid fuel supply (the average from this post). Note that the graph is not zero-scaled to better show the changes. You can see that the red curve involves oil supply continuing to grow at a rate pretty similar to the rate since the depths of the recession, and much faster than the overall rate of the last six years (the "bumpy plateau"). This requires the world come up with another 17mbd of supply in the next five years, though it only managed to come up with about 3-4mbd over the last five years, and that took a quadrupling of prices to achieve. I don't see where this much oil can possibly come from. Saudi Arabia is saying they aren't going to increase production much if at all in the next five years. Russia is pretty much plateaued. The US is long past peak, and will be lucky to avoid further declines. Iraq is the one hope for truly large increases in oil supply, but that increase has just barely started, and is not going to amount to more than a few mbd over the next five years. And that's just to hold global oil demand to only increase by 11mbd. 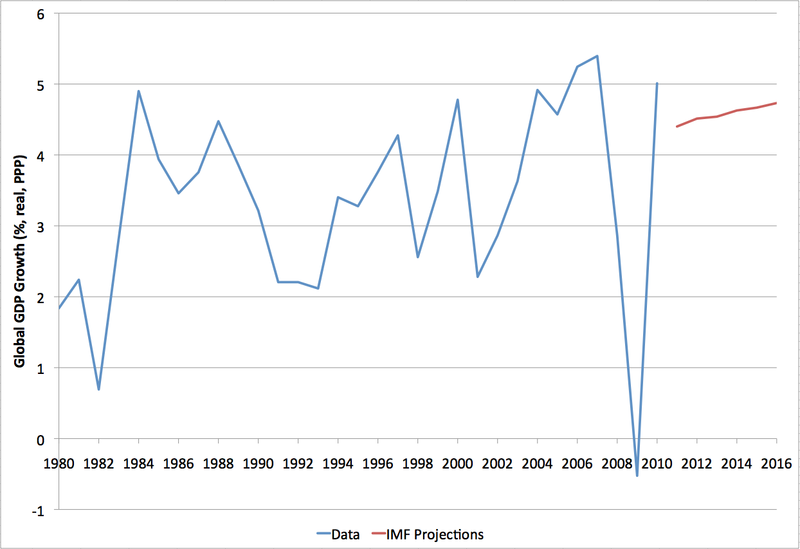 Clearly, nothing like these projections is going to happen. Instead, global oil demand is going to have to get a lot more elastic. To reconcile stagnant production with global demand, the world's people are going to have to undergo a paradigm shift similar to that of the 1980s, in which the world makes major efforts to use oil much more efficiently. Because people have experienced a complete attitude shift, they will become much more responsive to moderate price shifts than they have been in the last twenty years. The next question is whether this kind of global attitude shift could happen smoothly, without major disruption to global economic growth. I think that's extremely implausible. Certainly, it didn't in the 1970s when the big increases in efficiency were presaged by two major oil price shocks with ensuing recessions. And in general, my mental model is that people are creatures of habit who only change their way of thinking and operating when their existing approach starts to cause them serious pain. 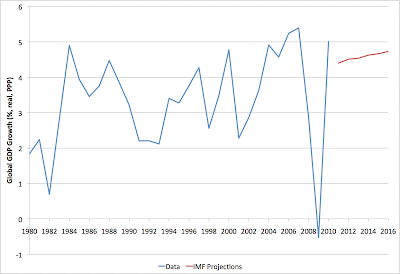 So I think the IMF's growth projections are seriously improbable. What is going to happen instead is that people will keep trying to grow without getting much more oil efficient, that won't work, oil prices will go through the roof, another global recession, or at least a major slowdown, will ensue, and then people will begin in earnest the work of starting to transition away from oil dependence. I can't tell you the timing precisely. It could easily be this year, it could be next. It's even possible that some other global crisis will intervene first (like the credit crash of 2008 did). But I will say categorically that there's no way we are going to get through 2016, as the IMF projects, with business-as-usual economic growth. Not on this topic, but I think you might find this interesting. There seems to be one of those "Both of these projections cannot come true" aspects. I would be interested in what you have to say. It is amazing that financial markets can't see this growth restraint looming. 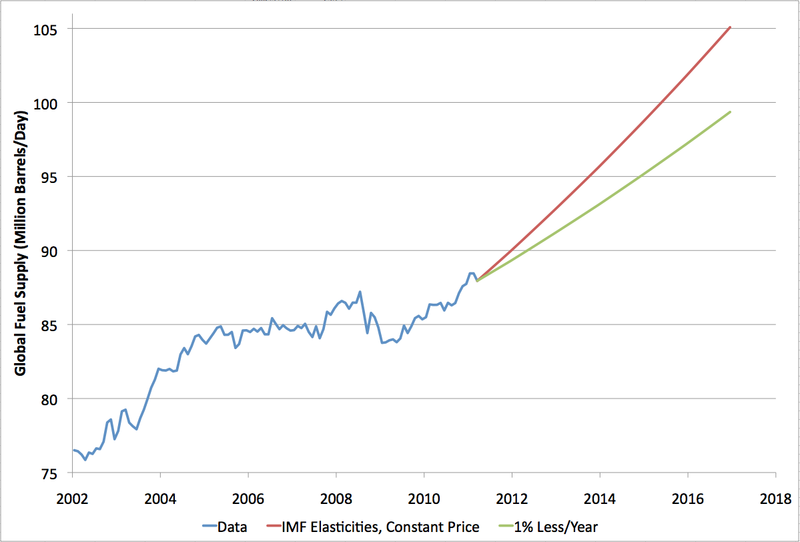 Jeremy Grantham appears one of the few financial managers to get the scale of the problem. Infectious Greed and others carrying Grantham's latest letter, which covers what he terms the 'Great Paradigm Shift' in resources and it is well worth a read. I laughed out loud at the price projection; then wondered that I was laughing. Been hanging out at this here gallows for too long! I want what they're smoking, and lots of it. BP data shows that only in the 60s/early 70s did 5 year blocks of YOY supply growth exceed 10 mb/d, peaking at 18 mb/d 1969-1974. You know, back when geologists would throw rocks and discover onshore giant fields in the process, and crude had hovered at $2/bbl for over 20 years. Time to go long on Zipcar, Trek bikes, others? Brian NextBigThing seems very gung ho on lsc from shales, eg Bakken. Says there are numerous basins to be tapped worldwide, that TOD forecasts woefully ignored the prospects to be had, yada yada. ND has brought on maybe the equivalent of a good sized offshore field in the last few years so I'm still yawning. I think it was J. K. Galbraith who said that these forecasts are best treated as ritual utterances by the high priests. Having four significant figures on their forecasts is a sign of a cult pronouncement. If they were honest, or scientific, instead of 4.513%, they'd write "About four-ish. Give or take. Maybe a bit less. If we're very lucky, could be more." These forecasts are merely intended to reassure the people that their leaders have a clue. They're always wrong but that never matters for the prestige of he forecasters. Off topic, I don't know if you can fit it in to your reading, but Stern & Kander looks like a serious attempt to reconcile mainstream growth theory with energy constraints. It's a better fit with the mainstream than are Ayres and Warr or the ecological economists. The best I've seen to date. First - this analysis used short-term elasticities, but if you're talking about a long-term/secular rising trend, you have to use long-term elasticities. That's the whole point of the distinction between the two. 2nd, you can't use elasticities developed in the low price range of the price curve for the high price range: they will be very different. In fact, this is strongly non-linear. Above about $80, investment grows in alternatives, especially batteries. As both R&D and manufacturing volumes increase, innovation and economies of scale are creating disruptive competitors whose costs will reasonably soon start to fall well below the old oil-based price norms - at that point oil consumption will continue to fall even if oil prices start falling. So the other IMF story of last week, that China will over take the US in Purchasing Power Parity (PPP) GDP in 2016 via growth can't happen. The real question is, will it happen because the higher oil prices collapse US GDP because America can't/won't adapt fast enough. Will China Slow Down by 2015?